A free typing test can be an effective way to test your typing skills. A good test will test your speed in typing the English language in words per minute. Many employers require you to be able to type at least 40 words per minute. Dark spruce forest frowned on either side the frozen waterway. The trees had been stripped by a recent wind of their white covering of frost, and they seemed to lean towards each other, black and ominous, in the fading light. A vast silence reigned over the land. The land itself was a desolation, lifeless, without movement, so lone and cold that the spirit of it was not even that of sadness. There was a hint in it of laughter, but of a laughter more terrible than any sadness a laughter that was mirthless as the smile of the sphinx, a laughter cold as the frost and partaking of the grimness of infallibility. It was the masterful and incommunicable wisdom of eternity laughing at the futility of life and the effort of life. It was the Wild, the savage, frozen hearted Northland Wild. They travelled on without speech, saving their breath for the work of their bodies. On every side was the silence, pressing upon them with a tangible presence. It affected their minds as the many atmospheres of deep water affect the body of the diver. It crushed them with the weight of unending vastness and unalterable decree. It crushed them into the remotest recesses of their own minds, pressing out of them, like juices from the grape, all the false ardours and exaltations and undue self values of the human soul, until they perceived themselves finite and small, specks and motes, moving with weak cunning and little wisdom amidst the play of the great blind elements and forces. An hour went by, and a second hour. The pale light of the short sunless day was beginning to fade, when a faint far cry arose on the still air. It soared upward with a swift rush, till it reached its topmost note, where it persisted, palpitant and tense, and then slowly died away. It might have been a lost soul wailing, had it not been invested with a certain sad fierceness and hungry eagerness. The front man turned his head until his eyes met the eyes of the man behind. And then, across the narrow oblong box, each nodded to the other. This free typing test will test your typing speeds in words per minute. It will also produce shareable results so you can challenge your friends or save to document your progress. Keep your fingers on the home row. Don't look at the keyboard. Don't watch the timer! Try practice mode for finger placement hints. My typing test forces you to type each word correctly before you can proceed to the next word. If you make a mistake, you must press backspace and correct your error. This is true in real life typing as well. Unlike most other typing web apps you'll find online, the keystrokes you use here to fix your errors count against you. 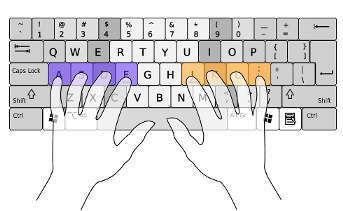 This is by far a more reliable test of your typing skill as well as a great learning aid while in practice mode.